Lisa Dwan returns to the Royal Court Theatre to perform a one-woman Samuel Beckett trilogy after a critically acclaimed sell-out run of his landmark one–woman piece Not I, performed at the Royal Court forty years after the theatre held its UK premiere. 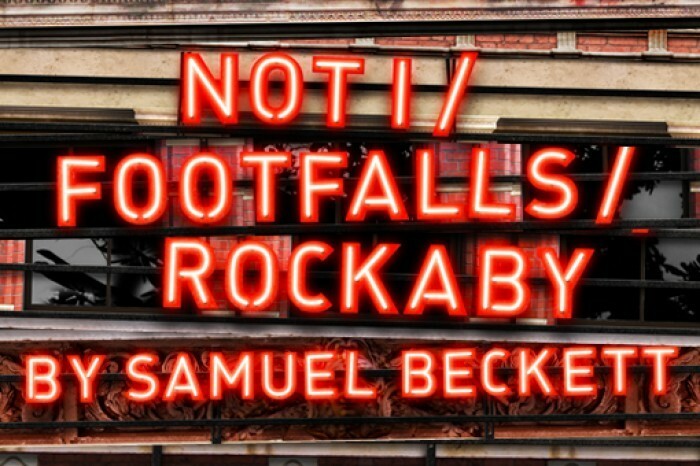 Lisa will perform Not I alongside two other Beckett classics Footfalls and Rockaby, directed by Walter Asmus. Beckett’s Not I is an intense monologue, set in a pitch-black space lit by a single beam of light. A disembodied female mouth floats eight feet above the stage and delivers a stream of consciousness, spoken, as Beckett directed, at the speed of thought. Lisa Dwan was tutored in the role by Billie Whitelaw, who originally performed the part at its 1973 UK premiere and was personally coached for the part by Beckett himself. Rockaby is probably the most famous of Beckett’s last works. It explores loneliness and features a prematurely old woman dressed in an evening gown, sitting on a wooden rocking chair that appears to rock of its own accord. Rockaby was first performed in New York in 1980 starring Billie Whitelaw and then at the National Theatre in 1981. Footfalls features May, wrapped in tatters, pacing back and forth like a metronome, on a strip of bare landing outside her dying mother’s room. Footfalls was first performed by Billie Whitelaw, for whom the piece had been written, at the Royal Court Theatre as part of the Samuel Beckett Festival, in 1976 directed by Beckett himself. Lisa Dwan has worked extensively in theatre, film and television both internationally and in her native Ireland. Film credits include; Oliver Twist and John Boorman’s Tailor of Panama and Bhopal – A Prayer for Rain due for release this year. In 2012, she adapted, produced and performed the critically acclaimed one woman play Beside the Sea at the South Bank Centre and on tour and starred in Goran Bregović’s new music drama, Margot, Diary Of An Unhappy Queen at the Barbican. She most recently performed in Ramin Gray’s production of Illusions by Ivan Viripaev at the Bush Theatre. Walter Asmus directs. He was Beckett’s long-time friend and collaborator, assisting him on all his productions at the Schiller Theatre in Berlin and internationally. His production of Waiting for Godot which toured extensively, including a 40 date all Ireland tour in 2008 was widely described as the ‘definitive production’.